The secret to the nifty container that constitutes your Paw Boss is two portals one for clean water (and soap) and the other for dirty water. 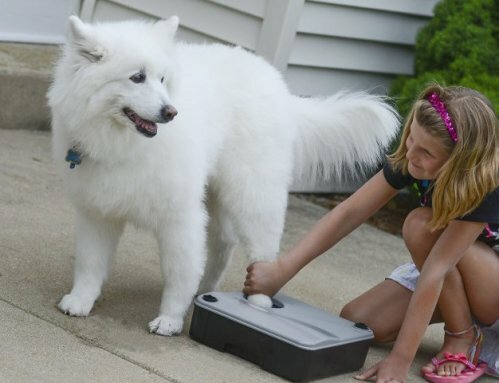 Once you fill the Paw Boss container with clean water and, preferably, antibacterial soap, this liquid will fill a 2.5 inch diameter container that has a soft scrubbing tool at the bottom; that's where your dog's dirty paws go. You clean each paw by placing it in that container and moving it around so that the scrubber can remove the soil, sand, or pebbles that might be sticking in your dog's paw pads or fur. But here's where the beauty of the Paw Boss comes in: There are two bladders in the container, one that holds clean water and one that holds dirty water. So, without having to get up and change the water to wash the next paw, you tilt the Paw Boss in one direction and it empties the dirty water into the dirty water bladder within the container. Then tip it in the opposite direction and clean water will fill the scrubbing container again. And so on, until all four paws are cleaned. With the use of pet antimicrobial soap in the Paw Boss, we used a third party outside lab to test the germs on the pets paw before and after the Paw Boss. Samples were tested for several weeks and a final report was provided to us. The results proved that the Paw Boss removed 99.5% of the bacteria and 99.9% of the fungi from the pet’s paws. The key is simply using fresh clean soapy water for every paw. I think this is a really neat invention. And those who have purchased the Paw Boss really seem to like it. Hot Stuff! Gourmet Chile Sea Salts Are Muy Caliente!